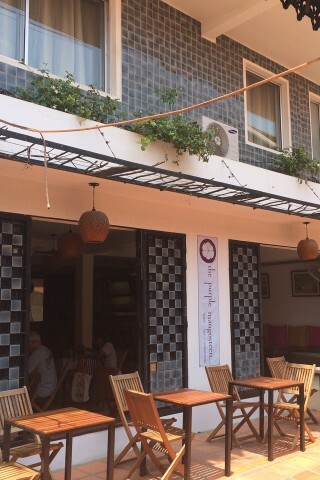 Purple Mangosteen is a beautifully constructed little hide-away, tucked down Siem Reap’s most fashionable street — as fashionable as we get around here anyway — with plenty of prime shopping and dining spots right on the doorstep, but out of the way of the chaos of Pub Street. Average rating 8.5 from 324 reviews. Long and lean, the three-storey boutique hotel has just six rooms and a real Mediterranean feel, thanks to the white walls, open spaces, subtle architectural features and beautiful moulded stairway. The air-con rooms themselves are contemporary, with lots of clean lines and artful bold colours on a predominantly white palette, and gorgeous tiled floors all of which combine to make you feel like you’re standing in a room that should cost a lot more than these do. Rainfall showers in polished concrete bathrooms complete the look. The rooms are full-feature, with minibar, security box and tea and coffee-making facilities. The hotel is topped with a flat roof with great views across the city, giving you a secluded spot from which to enjoy the sundown and cooling breezes, away from the buzzing crowds below. Meanwhile, the restaurant and bar on the ground floor serves up a selection of beautifully prepared Khmer and Western dishes at mid-range prices. This is a great place to stop by for a coffee, or a glass of wine, even if you’re not staying. Recommended. Check rates at Purple Mangosteen on Booking.com.